Bung Buk is a commercial fishery on the outskirts of Bangkok that is popular with local anglers and has seen very little angling pressure.The lake extends over an area of 6 acres and has variable depths down to 4m’s and is bordered by green pastures with very little surrounding cover lining its banks.The fishery is a mature lake dating back over ten years and has been subject to various stockings of fish over that period.With regards to the stocking of this venue, it is unclear as to the exact amount of fish contained in its depths. On exploratory fishing trips to Bung Buk Lake the Fishsiam team has caught numerous species including Striped Catfish, Rohu, Small scaled Mud carp and several species of Featherback. The lake responds well to conventional tactics suited to carp fishing in addition to the use of small ornamental livebaits and spinning presentations. This venue has very limited facilities and is rarely busy with anglers. 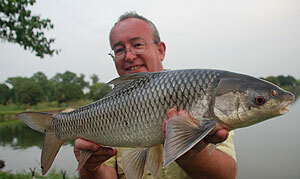 The lake regularily produces mixed bags of various species which are native to Thailand and other parts of Asia. The venue is situated in a quiet residential area and is an ideal venue to escape the vigours of nearby Bangkok and easily reached via expressway. With the variety of freshwater species contained in this venue ranging from carp to catfish through to other predatory species, this lake will be of interest to the vast majority of anglers. 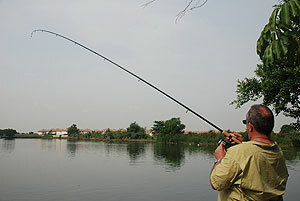 With no restrictions on angling methods at this venue visting anglers can choose to fish in their own style be it with lures, bait or groundbait. The quiet and relaxed setting makes this venue a welcome break for anglers wishing to take time out from the sometimes demanding pressures of angling for Monster Fish in Thailand. Trips to this lake can be arranged on a daily basis and are ideal for anglers located in Bangkok and the surrounding districts. Trips to this venue can also be combined in our weekly angling holidays if required. If you would like any further information about this venue or to make a booking please contact us using the button below. Please note that we are currently not fishing at Bung Buk Lake in Bangkok due to fish losses caused by recent flooding in Bangkok.